Digital Marketing refers to advertising delivered through digital channels such as search engines, websites, social media, email, and mobile apps. The digital building blocks of this type of marketing provide objective data that can be assessed, categorized, and analyzed in ways that were previously impossible. How much do you really know about your customers? It’s a question we marketers hear practically every day. Normally, we answer quickly and with confidence. We know our customers. But, do we really? Do we know their pain points, what motivates them, and how our organization can complete their “jobs-to-be-done” better than the competition? When marketing teams truly take a step back and dissect their marketing attribution model, the hard truth sets in like a cold chill, maybe you don’t know nearly as much as you thought you did. Marketing attribution within digital marketing is the analysis and process of identifying a set of customer touchpoints or interactions that attribute to a user making (or not making) a purchase decision. Attribution used to be pretty easy to track, but in today’s omnichannel world, these touchpoints can span from a consumer’s desktop device, to their tablets, video views, and to their mobile phone. There’s no question – modern marketers are dealing with an increasingly advanced customer. They are research-obsessed, demanding, and impatient; but ultimately, they recognize they are all that matters. If your brand isn’t doing everything it can to show a consumer how you can complete their “jobs-to-be-done” better than the competition, then your competition certainly is. Over the last few years, defining the key touchpoints in a user or customer journey has become increasingly difficult for marketers. We’re seeing more and more users span from their desktop or laptop computer to their mobile device or to their tablet when researching and educating themselves about a brand or product. That’s why it’s become harder to define what points through this user journey truly impact sales or profits the most. A customer conversion typically happens after a relationship has developed between consumer and a brand. But, what aspect of attribution is building the relationship the most? As fast as technology has evolved in the last five years, Google marketers have to move even faster to stay ahead of the game. There are three major factors that have massively influenced this digital marketing transformation. It shouldn’t come as a surprise to any marketer, the more you know about your audience, the more you understand what you can offer potential customers searching for your products. That’s why this article will be focused on why every organization needs to test different marketing attribution models, instead of just focusing on a last-click attribution. If Google marketing professionals wish to truly improve their customers’ lives and excel at creating the most attention-focused messaging, we have to collect what users are searching for in search engines, study the website analytics, and be able to seamlessly bridge the gap between the customer’s desktop experience and the mobile experience. But, more importantly, we need to understand how these cross-device experiences affect our customer’s lives and purchase decision. Which Marketing Attribution Model Is Right For Your Business? 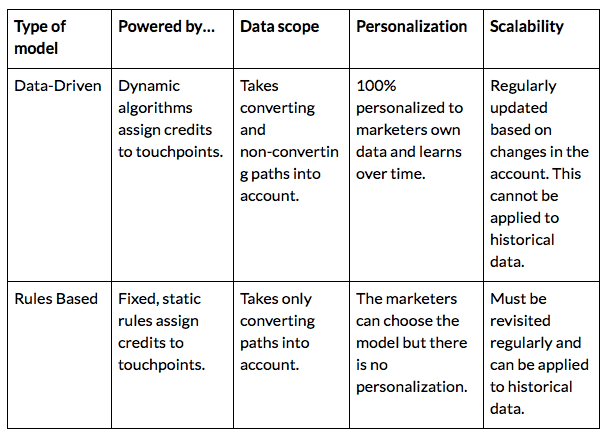 Brands, marketers, and data scientists create a myriad of marketing attribution models in order for them to gain a better handle on the customer conversion process and how their organization should value each conversion. These models enable marketers to measure across all touchpoints and identify the moments that really matter in shifting the customer journey from education to purchase. Just like your customers aren’t “one-size-fits-all” there is no one answer to which marketing attribution model is right for your business and industry. In the healthcare, education, and automotive industries, a linear marketing attribution model may be the most efficient to judge what parts of your brand journey create the most success. Where the cosmetics or beauty industry may benefit more from a time decay marketing attribution model. In addition, the telecom industry may find more value in a position-based marketing attribution model that focuses on the customer’s first and last interaction. If your organization truly wishes to answer that question, you have to align your businesses and marketing goals and test different marketing attribution models. Then delve into the cross-device analytics of what your marketing team is finding to help differentiate what model is best for your success. Last click attribution is the most commonly used customer touchpoint model. It attributes all the conversion value to the last touchpoint in the conversion path. This usually occurs with lower funnel keywords and devices, while upper funnel keywords and devices receive no credit for initiating or assisting conversions. 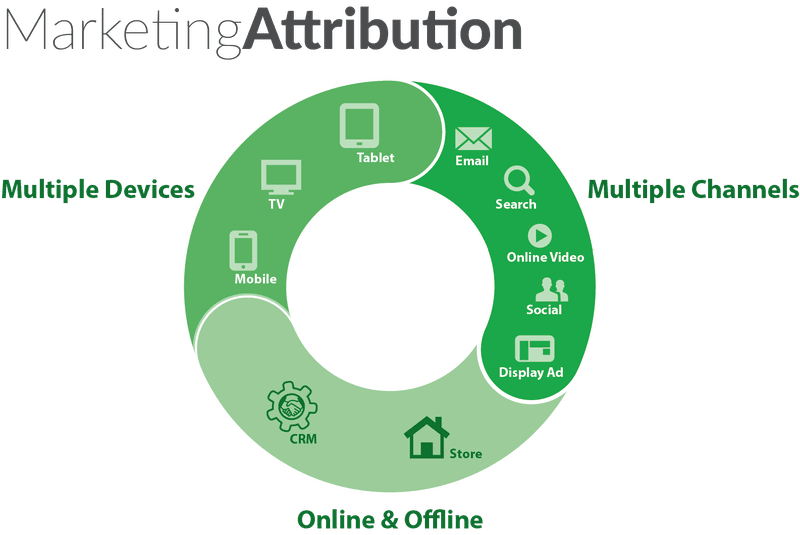 If your organization is completely focused on giving credit to the click that drove a consumer to your website or landing page and converted, then this marketing attribution model is perfect for your organization. However, if your business and marketing team desire to learn more about the full span of your customer’s journey, then a different marketing attribution model should be utilized. Last click attribution cannot measure the complexity of cross-device consumer behavior, where ad clicks occur on one device and the conversion occurs on another device. A first click attribution model is the exact opposite of last click, it’s solely focused on the first touchpoint or interaction in your potential customer’s brand journey. Regardless of the conversion outcome, first click attribution will give full credit to the first interaction that drove that customer to your website or landing page for the first time. This marketing attribution model normally utilizes upper funnel keywords and devices for customer interaction. If your organization is focused on what impacts lead generation and utilizing form fills, then this marketing attribution model is perfect for your brand. However, since this attribution model doesn’t place any emphasis on what drove the sale there are little optimizations to be made. A time decay attribution model will allocate the most credit or weight to the customer touchpoint that’s responsible for the conversion. It will also allocate less credit to a touchpoint that’s further away from a conversion. This marketing attribution model is great for marketers looking to understand and optimize the customer interactions that drive conversions as well as the touchpoints that led up to that customer conversion. If your business is focused on optimizing around the touchpoints that drove customer conversions, this is a fantastic attribution model that’s also very conservative in growth. However, if you’re trying to understand the whole customer journey evenly, this may be an inefficient model because early onset customer interactions will be ignored. A linear attribution model will assign credit or weight to all customer interaction points evenly. So, if your brand journey has four customer touchpoints, then each interaction will receive 25% of the credit of the conversion value. This is an incredible marketing attribution model for marketers looking to holistically understand the entire customer path evenly while maintaining a moderate growth strategy. However, if you’re looking to truly understand which customer interaction is the most effective then you may want a position based or last click-based attribution strategy because linear attribution will evenly weigh your highest performing interactions with your lowest performing interactions. A position-based attribution model will evenly weigh your first and last customer touchpoints at 40% of the conversion value while dividing the remaining 20% of the conversion value to all of the remaining customer touchpoints in-between. If your organization is looking for an aggressive growth strategy and you’re wanting to understand and give credit to each segment of the customer journey it will allow you to optimize your first and last customer interaction for continued growth and success. However, since the majority of the weight is distributed to the first and last interaction, your other touchpoints during the consumer’s journey may not gain as much attention as they deserve. First off, in order to qualify for a data-driven attribution model, your account must have at least 15,000 clicks and a single conversion action must have at least 600 conversions within 30 days. Now, if your account currently achieves those metrics, then data-driven marketing attribution may be a perfect model to better understanding your entire customer journey and what truly impacts conversions. Digital marketers using rules-based attribution are all about simplicity and incremental progress. Instead of relying on elaborate models to assign credit, they build and test individual rules that help to explain how their marketing channels work together. But, the benefit of the data-driven model is that it’s algorithmic, personalized and fully automated. Think about how you shop for most big-ticket items or book vacations. I could almost guarantee that out of everyone that ever reads this piece, there isn’t a single person who has booked a vacation on their phone in a single setting. If you have, you are bold. But, that’s not how the majority of society engages in a brand journey. They normally engage in several different devices at several different times throughout their purchase decision. Like we talked about earlier, a last click marketing attribution model gives all the conversion value to the last touchpoint in a consumer’s brand journey, where the upper funnel devices don’t receive any credit for assisting the conversion. So, if your brand is only focused on one aspect of the journey how can you truly understand what’s most effective? You can’t. Unless you’re looking at cross-device activity reports. Jenny is the definition of a foodie. She’s on her work lunch break and daydreaming about a trip to Spain. So, she takes out her phone and searches Google for “best food cities in Spain.” She’s prompted with many responses, but lands on a blog post about San Sebastian in the search results and it’s brought to her by Airbnb. Completely satisfied with this information, she continues her work and goes about her day. However, when Jenny gets home later that night, the thoughts of San Sebastian fill her mind. The entrees and deserts she viewed earlier are completely distracting her from Netflix. Seeing as she has a little more time to research San Sebastian, she gets on her laptop and heads to Airbnb. As she’s researching, not only does she look into the best places to stay, but the best food and the most exciting experiences during her stay. She finds some incredible information, as well as a place that fits her budget, but she’s not ready to book quite yet. The next day at work, she’s again on her lunch break and is scrolling through Instagram. When suddenly, she’s served a display ad for Airbnb as well as a highly detailed piece of email marketing talking about San Sebastian and the apartments, houses, or condos she was researching. She’s then called into a meeting and has to focus on work. That night, Jenny logs back onto Airbnb, spends a bit more time researching the right place to stay, the best places to eat and the coolest experiences she can do while she’s in San Sebastian and decides to book the trip. Which part of this consumer journey do you attribute with the most impact? If you’re thinking it is an individual part, you may want to think again. While individual parts are important, it’s the whole holistic brand journey that truly impacts a customer to make a decision. It can’t be limited to one touchpoint or interaction. As a team, they all work together in assisting and nurturing a consumer through your sales and education path. Sure, Jenny may have completed the purchase on a desktop environment and there should be some weight given to that conversion touchpoint, but how does that influence her more than the display ad she was served on mobile? Or on the initial mobile search where Airbnb was delivered in the search results? Bring new cross-device insights by showing the full cross-device conversion path for search campaigns from desktop-to-mobile-to-tablet so your organization knows where you’re converting. Provide an opportunity to show your brand how mobile is potentially undervalued based on last-click, last-device models. When all is said and done, each marketing attribution model may give your organization new insights on how to improve the platform, messaging, and device that you’re using to communicate with your true market audience. But, it’s only through testing and optimizations that you’ll understand which attribution models produce the highest ROI and most conversions for your business. If your organization is still shaking its head over Google Ads attribution models and what strategies your company should implement to increase brand awareness and maximize profits, reach out to Evolve Digital Labs for your free consult. SEM and Design: Why the disconnect? Far too often, we come across brands that consider the design of a site and Search Engine Marketing two separate projects, and the resulting pages fail to contribute to the end goal: achieving leads. The three primary reasons a designer neglects to consider SEM and SEO prior to designing an entire website, a single page or collateral material for a site are Resources, Process, and Values. This is a difficult issue to address because typically, search engine marketing and search engine optimization are believed to be additional components to a website or acceptable tactics for consideration after the website is finished. In reality, search engine strategy should be considered in the very beginning, with data (the voice of the customer) driving initial decisions and strategy. When handled in the correct way, the direction and certainty of keyword research provide a specific, linear path to visual success in a page’s design. Strategy and need should become dramatically less ambiguous, thus reducing the need for revisions based on visual messaging. Regardless of the craft or expertise, injecting a new element to a seasoned professional’s process can be difficult, especially when that craft requires a creative and emotional connection to produce success. The larger the corporation the designer supports, the more levels of approval, therefore increasing the difficulty or likelihood of implementing data like keyword research. Designers and writers alike are communicators of ideas. These professionals of messaging have struggled with search since its inception of mainstream marketing. I’ve often heard that these communicators battle with the idea of a machine or data telling them what to say or how to design, but the irony is that it’s the targeted customers asking the questions. It is the customers who drive that data, the very people to whom we are supposed to be marketing, messaging, and ultimately helping. The value of design is often dependent upon the specific brand and the artist. It’s a way to tap into the emotional elements of what the brand stands for and how the brain wishes to connect with this consumer. While some may argue that data creates interruption or unnecessary barriers of communication, these strategic initiatives cannot be ignored because they represent the voice of the customer. Search marketing and search engines have evolved drastically; there’s no longer a need, nor should there be a practice or recommendation, to oversaturate a page with unnecessary vernacular exclusively using data based on the voice of the customer. In the same way, every brand has style guides specifying which fonts or colors to use, customer-produced data from the search engines can also be guidelines, acting as a litmus for consideration when developing websites for developing content when designing landing pages and designing messaging. There are a few possible remedies to three interrupters of incorporating search marketing into the world of design. Step 1: Provide the necessary information with the project assignment. Keyword research and visitor data isn’t an afterthought. It should be baked into the visual concepts, then tested through behavior online. Step 2: Develop a process to incorporate Search data into the design. This action is as simple as validating data and desired outcomes during the rounds of revision to ensure that all the essential communication points and consumer needs are being met. Step 3: Create search marketing guidelines. These guidelines can be incorporated into the value of the brand thought leader, educator, or advocate. There’s a way to align how people search and what they are searching for into the basic guidelines of how you communicate with people online. https://evolvedigitallabs.com/wp-content/uploads/2019/01/evolve-digital-labs-logo.png 0 0 Aaron Stevens https://evolvedigitallabs.com/wp-content/uploads/2019/01/evolve-digital-labs-logo.png Aaron Stevens2015-07-13 05:04:382018-08-01 18:23:51SEM and Design: Why the disconnect? If it were exclusively up to me, I would still be the President of Evolve Digital Labs, a premier search marketing agency. The one I started and helped build. From one person to fourteen amazing people. But we do not always get to choose what happens personally or professionally. So true to our name, change is expected and inevitable. Today, I lead an organization focused on online growth and digital innovation. If the accepted science is correct, and we do completely shed ourselves inside and out every seven years, then the change is appropriate. I am no longer interested in decoding an algorithm. I know that success is not found in search engine rankings alone. Keywords have never been as simple as a data point. It is not enough to focus on lead generation. Instead, I want to lead this generation of change. As blue collars dissipate and the starkness of white collars unforthcoming, a new assembly line and asset management is needed. I have been challenged and changed by those with whom I share an illustrious responsibility and connection. Now, the focus is on the consumers of the world and their needs. Empowering the customer through data and search is the beginning. Yes, search. Search is a consumer-centric channel. The consumer vehicle four out of five online sessions include. Search is more than Google and Google is more than search. Google is an innovation platform. They redefined how we hear the voice of the customer. The outcome is their focus. The value comes to the consumer and the business through behavior, not descriptions. We do not only understand it, we embrace and promote it. We will continue to help companies be found. We will continue to connect our clients with the right customer and the customer with the power to get the job done. We do not relinquish our rights nor refute the need to improve a brand’s digital assets. Yes, we mine keywords, we use the data of the consumer online provided by search & social giants. The change is how we evaluate the market and select the customer and the confidence in what is necessary to invest. There is a need to deliver a marketplace assessment a online. There is a need to build a strategic framework for profitable and scalable growth. There is a need to improve and innovate the results of a consumers experience online. Evolve Digital Labs is proving the value of a new model for growth online. I stand proudly on the backs of the brilliant and dedicated people who built a new meaning to our name. It is through our superior people and process that we have leveraged technology to provide services that far exceed those of a search marketing company. I am one of the lucky ones. I wake up feeling privileged and I fall asleep from mental exhaustion because every day I am challenged by the people around me and the problems we are paid to solve. The work, to me, is necessary. It fills my heart and keeps it beating while my children attend school and my wife improves the world one trialed family and adolescent at a time. The connection I feel to my professional responsibilities, my staff, clients, and partners amazes me. To all involved, thank you and welcome. People not only follow healthcare organizations’ social media profiles, they trust them. Although it was hardly available even ten years ago, social networking has grown to be a major marketing platform for cultivating relationships. Every day, millions of consumers attend trusted networks to collaborate and share experiences; healthcare brands are capitalizing on the opportunity to communicate with this audience. From social media profiles to review websites, new digital channels give full power to word-of-mouth marketing. In fact, a poll by QuantiaMD reveals 65% of physicians have switched from traditional advertising to using social media marketing to connect and engage with potential patients. Perhaps itas because 78% of consumers trust peer recommendations, while only 14% trust advertisements. The reality is patients are more frequently referring to online reviews when researching potential physicians. In fact, a 2012 study by the PEW Research Center reports that one in five Internet users consults online reviews of doctors or healthcare facilities. Popular websites for physician reviews include vitals.com and healthgrades.com, while healthcare facilities are typically reviewed on Google+ Local. Unfortunately, as revealed in the same report, only 3-4 percent of Internet users are posting the reviews, and in many cases, it is the unsatisfied patient that decides to share his or her poor experience. 1. Dilute negative feedback: The most compelling reason to seek reviews is to effectively control your reputation, especially if your brand is currently suffering from a sea of negative reviews. Patients are taking the time to look up online physician and healthcare facility reviews; asking for your current patients to provide their own feedback gives you the opportunity to take a proactive stance and influence customers and control your online material. 2. Promote practice: A highly-rated Google+ profile will surface more easily in search results, which is why it’s important to build out a page and encourage reviews from patients. In addition to relying on patients to supply feedback, it’s also important for the brand to actively share healthcare news, whether branded or not. A booming profile: including photos, links, and videos, helps build a presence in online communities and solidifies relationships with current patients and encouraging referrals. 3. Improve relationships with current patients: Asking for a review from a patient following an appointment, whether it was for a checkup or a surgery, is a fantastic way to show your concern for the quality of healthcare you are providing. That will keep you accountable with every patient, and while it may seem risky to direct patients to share their stories on such a public platform, most people who are satisfied with their experiences will be more than happy to do it. Healthcare marketing was once about interrupting people to broadcast messages. Today, it includes sharing on social media channels to communicate your commitment to patientsa well being. Success in healthcare depends on a brand’s ability to deliver value and build trust. By reaching patients off-site through search engines and social media, healthcare brands can convey a sense of commitment to patients, in addition to earning a more expansive presence online. It’s growing more common for people in need of healthcare to explore their options online before making an appointment. With search engines making it so simple to compare and contrast brands and provide answers to questions, why wouldn’t someone start their treatment from the comfort of their home? Because people search for solutions online, digital campaigns are an unavoidable aspect of an effective marketing strategy for healthcare brands. But even the face of digital marketing changes as new mediums and opportunities for engagement gain traction. Blog posts, white papers, and email newsletters still play a viable role in online healthcare marketing strategy, but they alone are not enough to thrive, especially when lead generation and conversion rates are the lifeblood of an organization. So where do you start? Determining your audience is a two-fold process, but the steps coincide with keyword research. The first challenge is understanding how your solutions can fulfill needs for your consumer base. Most companies have this figured out early in the product development phase or through keyword research, which should illuminate gaps in on-site content. The second aspect is defining the audience you are targeting; this becomes more evident as you organize the volume of traffic for different keywords. However, itas not enough to define them as the parties needing your solution or service. Effective healthcare marketing strategy will seek a comprehensive view of these individuals. By taking stock of your audience’s demographics: age, income, gender, and other details, you can combine your observations with existing research to determine effective marketing approaches. Some healthcare companies, particularly those focused on older demographics, are inclined to ignore social media and leave that medium to younger generations. We do not recommend this. According to a 2010 Pew International report, the number of social network users among the 50-and-older crowd increased by 88 percent over the past year. Among the 65-and-older crowd, social media use doubled. Today, three years later, we can only imagine how many more older adults are active online. Developing and monitoring social media profiles is a time-consuming process, but the resulting digital presence has potential to be one of the most valuable aspects of your healthcare marketing strategy. Additionally, because Generation Y expects brands to be active on social media channels, ignoring the need to communicate via Facebook or Twitter may portray the brand as unwilling to adapt. Additionally, lead generation resources, such as a newsletter sign-up or a preventative care worksheet a should be prominently displayed to maximize leads and conversion opportunities. 2. Update content Content also needs to be consistently updated and directly related to the terms your brand is targeting. Use basic SEO principles to outfit your website’s content with keywords that will appeal to online search queries. Online search traffic can provide a valuable stream of promising leads when this optimization is properly done. 3. Enable mobility Websites should also be mobile-optimized. This includes working location-specific keywords into your content and facilitating tasks for visitors. For example, enabling phone numbers to automatically prompt a call when clicked will allow visitors to seamlessly schedule an appointment. Forward-thinking healthcare marketing strategy will develop mobile-optimized lead generation and contact forms that can be easily filled out on a mobile device, making your company more accessible and creating a new stream of leads. Search engine optimization is difficult. Achieving favorable positions organically in the search engine results pages does not happen overnight. Fortunately, there is still a way to score a position at the top of a page, thus capturing the attention of potential patients. Paid Search is an advanced form of advertising that displays sponsored messages to searches containing specific keywords. Sponsors only have to pay when the ad is clicked, making this advertising channel more budget-friendly than traditional methods. Just make sure you are sending visitors to strategically-designed, relevant landing pages. Between Google Analytics, social metrics, and strategy insights developed in-house, digital marketing delivers critical information that helps you understand how campaigns are performing, particularly in relation to lead generation and conversions. By reviewing this data consistently, marketers can identify areas for improvement and other campaigns that might benefit from a greater investment. Ultimately, these changes should help boost conversion rates and improve the ROI from your healthcare marketing strategy. In an industry growing more competitive and saturated with options, healthcare marketing strategy professionals must discover new ways to set their brand apart. Be mindful of the opportunity existing on the digital front, and be willing to invest in the creation of content, on-site optimization, and paid search. We’re big fans of Keyword Research. Huge. We include it in our SEO Audit because we know how a brand can benefit from targeting the right audience with its site. It’s pretty obvious how a client can use keyword research for Paid Search; bidding on suggested terms will prompt the display of a relevant ad to the searcher. If implemented strategically, the campaign will direct paid clicks to keyword-specific landing pages. How do I safely use keywords on my site? What many clients don’t understand, however, is how to use keywords for organic search. Recent updates in Google’s algorithm penalize websites that try to manipulate the system. One example is the creation of thin content; webmasters will build out thousands of pages containing one or two paragraphs. These pages provide very little value to the visitor; rather, they exist only to house keywords and trick Google into thinking the site is authoritative on a subject. If your site has experienced a sudden drop in traffic, it could be the pages are in violation of Google’s policies. Before you lose all hope, let’s look at some best practices for organic keyword usage. We can fix this. The web address of a page is a critical element; it conveys to Google a summary of the content on a page. We definitely recommend using a keyword in a URL, preferably close to the domain. The URL doesn’t necessarily have to match verbatim the title of a page or post, which is helpful for blog posts especially. Much like the URLs, the title tag is a very important element; it reinforces the subject of the page. Every page should have a unique title tag that contains a keyword close to the front. Because title tags show in SERPs and typically play a significant role in helping searchers decide whether to click through or not, we also recommend adding a branded phrase, such as a company name, to the title tag. Make sure to keep everything under 70 characters. These elements are also found in SERPs, but search engines don’t take the contents into consideration when ranking a page. Still, people searching for a solution rely on meta descriptions to deliver a sneak peek of a page, so it’s a good idea to use keywords when relevant. Here’s where you need to be careful. Penguin, Google’s most recent major algorithm update, punished an extraordinary number of sites that engaged in unethical linking tactics, such as link buying, cloaking, and abuse of keywords in anchor text. The first two mentioned are quite obviously sketchy practices, but the last one can be more difficult to catch. When a site has too many links that are tagged with keyword-rich anchor text, Google will perceive this activity as intentionally manipulative. (assuming that’s relevant to the page, of course). and so on. Google Instant Search automatically fills in a query as you type, revealing common long-tail searches that relate to a keyword. It’s not always a home run, but it certainly can inspire new content ideas that will answer specific questions for the segmentation of your audience. This method is fantastic because it’s showing real questions that real potential customers are asking online. It provides your brand with a chance to create something from it, whether a detailed blog post, landing page for a product, or even a visually dynamic infographic. Keyword research is still a critical element of attracting customers to a site. Why wouldn’t we want to know what industry-relevant terms are frequently typed into Google? The problem with keywords is when brands greedily try to either rank for unrelated (or hardly-related) phrases AND when brands try to rank for relevant terms in unethical ways. Hopefully, this post will help you remember to focus on customers’ needs when generating new content pieces and optimizing your pages. If you’re feeling left out because you don’t even have a list of keywords to refer to, send us a note. We’d be happy to do the research for you. We’re really good at it. In the last few years, many traditional agencies have tried and failed to dip their toes into search marketing. Others have tried to find partner agencies but experienced limited success. Either way, it has left a bad taste in both the agency and their client’s mouth. Here is a list of common mistakes and a few ideas for the agencies to consider before partnering or investing in search. -Famous last words. Sorry, but SEO isn’t a shot you inject into your website. Success in the search engines is a collaboration of many parties within your organization and outside of it. It takes a great deal of research and strategy. Optimizing a website for Google extends beyond the technical upgrades to a website. It now includes adding supportive content to the site that answers consumers’ questions and (bonus!) features keywords for which it aims to rank. A website is not much different than a physical store where most transactions still take place. SEO improves the user’s experience when navigating a website. Pushing these efforts to a later date or half-assing the work prevents a website from earning valuable search engine real estate. Here’s the icing on the cake: The limited number of customers that reach the site are likely unsatisfied with the on-site content if the brand hasn’t utilized keyword research as a guide for solving problems. 2. Lowest person on the totem pole has the responsibility of managing or implementing. It isn’t that this is an inherently poor idea. Often these positions can afford the time for massive amounts of learning. The problem starts when the reporting and requests come in. The lowest folks on the totem pole can’t always move the needle when it comes to resources; they do not have the authority to spend the budget or allocate a team members’ time. The other issue is the lack of experience they can bring to the project. To be successful in search marketing, it isn’t enough to just have an understanding of the technology, there must also be an understanding of the consumers’ needs. This critical awareness typically comes with time and experience (although not always). 3. More time is spent on analytics than on the campaign. The tools and the information available to us are amazing; it is vital to review and understand the data for future success, but it’s easy to get distracted or discouraged by the constant fluctuation of traffic or SERP positions. An action is typically more valuable than contemplation. It is absolutely important to spend time setting goals and creating a meaningful report, one that gives specific direction and tangible steps. That is when the investment of time will pay off. Logging into Google Analytics every day will not change the results. 4. They just do not believe in it. There isn’t much an agency can do when there is not a belief in the power of the search engines. Like it or not, it happens. When the decision-makers of a brand haven’t experienced SEO success firsthand, they’re not likely to consider future efforts worth the required time and budget. While I completely understand the need to build a brand and maintain the integrity, it seems that agencies like this miss the point and power of search marketing. They are looking at a website as a static extension of the brand. While that is true to a degree, a website should help you learn about and mold the brand, and in large part, lead it. Improvement is a core concept of search marketing that agencies need to understand. The improvement should come from consumer feedback and data. 2. Function, then form. While aesthetics have and will continue to improve online, the simplest of sites still prove to be successful. Function rules. Consumers have a job to do when they are searching, even if it is something mundane. If the best attribute of your content is the design, it will only be as successful as the trend. 3. A consumer search = A consumer need. What is the starting point for online success? Consumer need. Think about the volume of search for an industry combined with the value of a transaction. Those two factors greatly contribute to what industries and companies are willing to invest. 4. Bounce rate and conversion rate = consumer satisfaction Learn what content and messaging people respond to and optimize the format in which you present it. Search might be the most effective way to test messaging and conversion paths. If you have a low bounce rate, your ability to optimize for conversion is greatly improved. May not a novel concept to all, but there are those out there who haven’t looked at this way. Search marketing involves more than keyword-enriched metadata and 301 redirects. We scratch our heads when companies donat see the value of investing in efforts that yield results almost instantly. Google is a digital matchmaker; it aligns customers with potential solutions to their queries. Maybe that’s why we and so many other internet marketers have chosen to come into work every day and follow Google’s rules blindly; we see that it’s an opportunity to improve Evolve’s and our clients’ processes. Search tactics and trends shift over the months, but the basic motive remains the same: to meet potential clients halfway and win them over with an effective on-site strategy. Want to hear more about Search? Give us a shout. Or check out our dynamite SEO Resources Page! Multiple Domains: Make it stop. Lately I’ve been seeing a lot of brands that have multiple domains, particularly local companies. I get it. Well, sort of. These guys figure more separate websites will equal a greater web presence, so they have a different domain for different locations and even services. What they don’t realize is that spreading out across multiple domains actually works against them for several reasons. I’ve written about duplicate content once or twice. It’s a pretty interesting sh*t show, especially because so many webmasters don’t even realize that their pages are duplicated at times. When one brand has multiple websites, each featuring a specific location or service, there’s likely going to be duplication. Brands usually don’t want to write unique content for each domain (after all, content creation is expensive), so they often have the same company description, philosophy, and paragraph for similar or even identical products. This means you’re making the Google bots do the same job twice. And that’s not cool. They will lash back by making the sites really difficult to find online. It will hurt. If you insist on keeping your many domains, at least fix the du-co.
is divvied up among however many domains exist. It’s confusing for users to search a brand in Google and be served a full page (or more) of different domains to choose from. More than anything, it’s annoying. Stop confusing your visitors. Give them one site to love. I’m sure there are times when having more than one domain for your brand can work in your favor. Companies have been successful in this effort, and for that I shrug my shoulders. The problem arises when you start scooping up domain names just to squeeze in location-based or service-specific keywords. If you can’t look your grandmother in the eyes and swear that each domain serves a unique, specific purpose, you should seriously consider clustering your digital real estate. A few redirects here and there, maybe some updated content creation, and you’ll be good to go. It’s hard enough to manage one site (for us, at least); you, customers, and those search bots will appreciate being able to find your brand at one stop. If you’re starting to worry about the state of your site, you might want to check out our SEO Audit or consultation services. We’re awesome at what we do, which is just one of many reasons why you will enjoy working with us. Check out our SEO Resources! https://evolvedigitallabs.com/wp-content/uploads/2019/01/evolve-digital-labs-logo.png 0 0 Aaron Stevens https://evolvedigitallabs.com/wp-content/uploads/2019/01/evolve-digital-labs-logo.png Aaron Stevens2012-11-29 02:23:312018-07-30 19:07:03Multiple Domains: Make it stop.